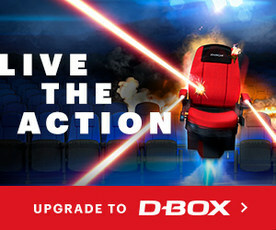 D-BOX is the pioneer and world leader in immersive cinematic motion created specifically for the movie theatre industry. This unique and patented technology uses motion effects specifically programmed for visual content which are sent to a motion system integrated into a seat. The resulting motion is perfectly synchronized with the on-screen action, thus creating an unparalleled realistic immersive experience.D-BOX's motion has excited millions worldwide. Depending on the location or auditorium we offer two styles of D-Box seating. Our D-BOX cinema luxury recliners provide our signature realistic immersive experience with an additional level of comfort. Made with quality fabric, designed with an adjustable footrest and motion controller, our D-BOX recliners provide the ultimate enjoyment and cinematic experience to all Moviegoers. Movie show times featuering this style of D-Box seating will also indicate Kick Back Seating on our web page. Our standard D-Box red chair has great comfort and all the action. Films that are offering this styleD-Box seat will display with just the D-Box indicator on our show time pages. Movies presented in D-BOX have an additional upcharge from $5.00 to $8.00. What should I expect from my first motion chair experience in D-BOX? Your first experience in D-BOX will allow you to feel as though you are in the movie. Your sensory engagement will be heightened and the barrier between the audience and screen is eliminated. Not at all, our phenomenal success lies in the genius of our motion designers. By meticulously designing and programming every movement, they ensure that the motion is placed logically and at the appropriate moments, so as not to distract from the film. No, there is no worry. All the motion effects are carefully produced to replicate the action on-screen. Furthermore, each moviegoer can adjust the intensity of the motion, as each seat has its own motion intensity controller, that allows the motion to be adjusted from high, medium, low and even turned off completely. Yes, and kids love it! Furthermore, the motion can be adjusted if necessary with the use of the motion intensity controller. D-BOX technology uses motion effects specifically programmed to be perfectly synchronized with the on-screen action to create an unparalleled, realistic immersive experience. We are now recognized as adding another layer to the storytelling and thus enhancing the moviegoing experience.